"I have come to show you that, while you are seeking to find God, God is likewise seeking to find you. 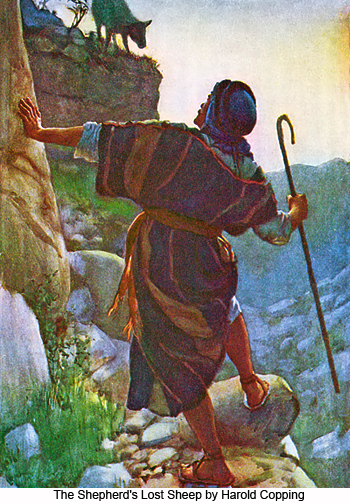 Many times have I told you the story of the good shepherd who left the ninety and nine sheep in the fold while he went forth searching for the one that was lost, and how, when he had found the straying sheep, he laid it over his shoulder and tenderly carried it back to the fold. And when the lost sheep had been restored to the fold, you remember that the good shepherd called in his friends and bade them rejoice with him over the finding of the sheep that had been lost. Again I say there is more joy in heaven over one sinner who repents than over the ninety and nine just persons who need no repentance. The fact that souls are lost only increases the interest of the heavenly Father. I have come to this world to do my Father's bidding, and it has truly been said of the Son of Man that he is a friend of publicans and sinners.